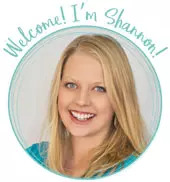 by Shannon Clark in Gift Ideas | 8 comments | Contains affiliate links. Try these tips for doing Christmas on a budget – without feeling like Scrooge. You can make this a magical Christmas and still stick to a tight budget. Our hearts swell along with the Grinch’s, as he joins in song with the Who’s of Whoville, though bereft of their Christmas decorations and presents. We celebrate with Scrooge as he leaps down the street on Christmas morning, doling out gifts to the poor. Charlie Brown’s protest of the ‘over commercialism of Christmas’ and his rag-tag Christmas tree are beloved by all. Everywhere we look are cultural reminders pointing us back to the true meaning of Christmas, but you wouldn’t know it by the way we go right on spend, spend, spending through the holidays. I polled some members of the Affording Motherhood community recently about their biggest challenges sticking to their Christmas budget. The responses were pretty surprising. But those were far and away surpassed by another problem that caused people to overspend their Christmas budgets. And that was the ‘E’ word. I’ve come to think of this as a four-letter-word, even though it actually has 12. This one little word has the power to push people into debt for this annual holiday and in some cases to even skip out on necessities like groceries to please those around them. The good news is you can still give your family a fantastic Christmas, even if you plan to cut back on your spending this year. 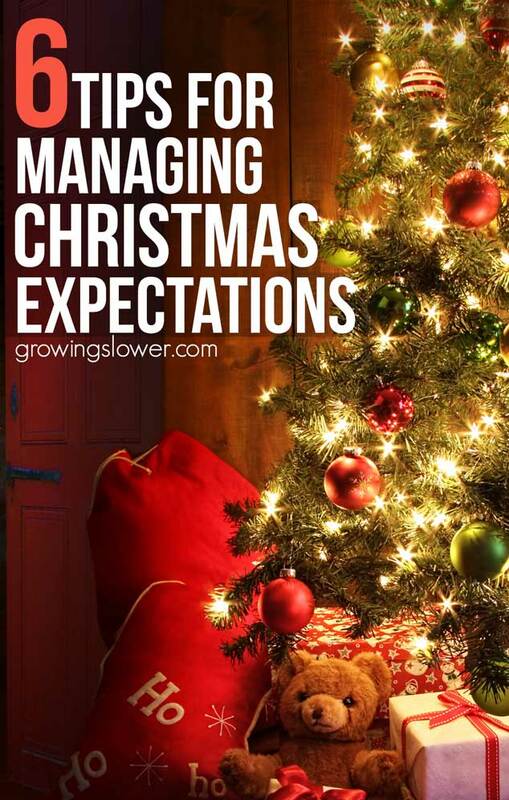 These tips for managing expectations at Christmas will help you do just that! Before you think about managing expectations at Christmas, find out what those expectations actually are. Take some time today to talk to your immediate family and find out what’s most important to them to make this a joy-filled Christmas. What activities and gifts were not on their must-have lists you might be able to step back from this year to save money and reduce stress at the same time? Instead of Mom or Dad taking full responsibility of Christmas shopping, let your kids get on the action. Take them to the store or help them go online and allow them to select a gift that one of their family members would love. I can only imagine what it would be like to tell a 14 year that’s expecting an iPhone that Christmas isn’t going to go the way she wants it. I’m sure it may take some time to readjust those expectations. Remember though, you set the standard for your family. This is your chance to instill a solid foundation when it comes to both generosity and finances. What a huge gift it would be to your children to help them learn these lessons before leaving the nest! Another way to put those expectations into perspective is to redirect attention to the true reason for the season. In my family, we always make a birthday cake for baby Jesus on Christmas Eve after attending a candlelight service together. While I love those traditions, I also know it’s important to keep our focus on the greatest gift throughout the holiday season. We’ll do that by doing a short and simple daily reading and light candles. It’s super quick and inexpensive to make your own Advent wreath. Sometimes, it isn’t the kids in the family who have a case of the ‘gimmies’. From time to time, I get an email from readers sharing that it’s the grownups who are making Christmas more stressful and expensive. Sometimes it’s the in-laws who don’t do DIY gifts. Or the adults are obsessed with name-brand toys for their kids. Perhaps your extended family has grown over the years and each member of the family is expecting a present. In these situations, there are a couple of options. First off, of course, communication is always the best path. If expensive name-brand gifts are not in your budget this year, the best way to avoid disappointment on Christmas day is to share your plans beforehand. Remember to emphasize the positives: you love them, you’ll do everything you can to find gifts they’ll love and are within your budget. You might want to be open about your reasons for choosing to do Christmas on a smaller budget this year. Finally, consider offering some possible solutions. Maybe suggest drawing names for the adults, so there are less presents to buy, but each one still gets to open a gift. Yes, it is possible it it won’t be received well. On the other hand, it might be a relief to your other family members and help take some expectations off their shoulders as well. Those people you were trying to please or impress with your brand name gifts and your Pinterest decorations and dinners…they probably feel the same way you do. And remember, there are many great Christmas gifts on a budget that aren’t DIY. Here are some of my favorite frugal gift ideas to get you started. It’s true, your best efforts to communicate your dream of a debt free Christmas to your mother in law might not go over so well. In those moments, it’s up to you to decide how far you’re willing to go for your goals. Are you willing to face the consequences of saying “no” when spending more doesn’t line up with your goals and values? It might sound scary and awkward to defy expectations, but in all likelihood, it’s a temporary discomfort and not life-altering. Answer the question for both the positive and negative potential outcomes. Get as crazy and as exaggerated as you can. Soon you’ll see that although disappointing expectations and saying “no” can be painful, choosing to cut back on the gift list or making simple handmade gifts won’t be grounds for estrangement. When deciding whether or not to meet all the swirling expectations surrounding Christmas, remember your reason for wanting to stick to a budget in the first place. Could you avoid the stress of being short on funds after the holidays? Maybe it would mean you start the new year without any new debt. For some, it might allow you to move through Christmas without cutting back on essentials like groceries! Would it give your kids an opportunity your kids to be less entitled and more generous? Could you offer a more peaceful, joyfilled version of yourself to your family, instead of rushing around in the busyness of shopping? Ultimately, as the Grinch discovered, Christmas doesn’t come from a store. Although we may see messages of consumerism at every turn, we can manage expectations at Christmas by instilling strong values in our children, communicating with friends and extended family, and choosing the best for our families and our financial futures. If you’re ready to make this the year you thoughtfully prioritize your spending while still creating a magical Christmas to remember, join us for the Christmas Budget Challenge. You’ll get a free printable budget, frugal gift ideas, and encouragement from Facebook group. What are the hardest expectations for you to navigate at Christmas? I really like this realization that we need to be aware of and deal appropriately with everyone’s expectations. Sometimes it’s those around us, but often it’s just our own idea of what we think they expect. I agree; communication is key. And in the end, we need to do what is right for us and our family, rather than respond to felt pressure from others. I also love that you reminded us that even in our gift-giving, we need to remember the true meaning of the season. Thank you so much for your kind comment! 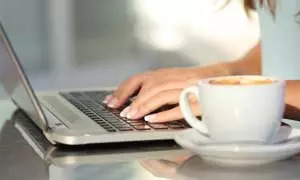 I always get a little nervous about hitting publish on a post like this that really asks people to go against the grain, but these things have been important in my life to help me be at peace with cutting my budget when I needed. You’re right on with the idea that often it’s the expectations we place on ourselves because of the pressure we believe we feel from others, that may or may not even be there! :) That’s a big one for me. Thanks for the post. Christmas is such a beautiful time of year, but it’s too easy to let the pressure “rob” us–both of the sense of purpose behind the gift-giving and of financial security! Although DIY things do take some time, I’ve found them to be both some of the least expensive and some of the most meaningful things to give. For me, the time spent creating the gift tends to be focused on thinking about the person I’m making it for, which is extra special. Plus, it allows people to give gifts to those who find it their most powerful way of feeling loved :) Even hand-dipped chocolate pretzels can be meaningful to the special friend who knows you made it for them! Absolutely! I absolutely love what you said about the time you spend thinking about your loved one as you’re making the gifts of them! That is so true, and such a great way to bring meaning and love to your gift. The chocolate pretzels are a great gift idea and sound A-mazing too! Great point Shannon! I’m not so good at communicating my expectations. I am a people pleaser and it’s hard to feel like you are letting people down. But, I don’t want my 13 month old to be spoiled or expect to always get everything he wants. Since this is our 1st child, I’d rather set the stage now so our family knows from the get go that we will not be “going all out”. Ever. Thanks for reminding us the true reason for the season. We are only human, and need the reminding. Way to go Nicole! This is the perfect time for you to set your intention for what you want Christmas to be for your new family. I know it is so hard to feel like you’re disappointing other family members, so I hope that this will be great timing for you and that everyone will be supportive of your decision to keep things to a realistic budget. I hope you enjoy this time with your son. Seeing Christmas through our children’s eyes is such a gift in itself!